And by the way -- Stein wants there to be a sequel to "Ferris Bueller's Day Off"
WASHINGTON (CNN) -- Ben Stein says he knows how Sen. John McCain can win in November: Karl Rove. 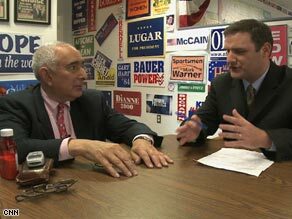 Ben Stein tells CNN's Mark Preston that John McCain is running the "most pathetic campaign" he's ever seen. That's right, that Karl Rove. At a time when McCain is seeking to distance himself from President Bush, Stein argues McCain needs to enlist Bush's chief political guru in order to defeat Sen. Barack Obama. "I don't discount the possibility that some really smart person at the McCain campaign might go over to Karl Rove, and say 'We will offer you all the kingdoms of the world if you will come and guide our campaign,' " a hopeful-sounding Stein said in a recent interview, during which he also discussed Al Franken's Senate bid and his thoughts on a sequel to the 1986 box office smash "Ferris Bueller's Day Off," which launched Stein's film career. Stein is not unlike many Hollywood types in that he speaks his mind when it comes to politics. But what separates him from the pack is his professional background and party affiliation. Did I mention that Stein also worked as a speech writer for President Richard Nixon and President Gerald Ford? Yes, that's right, that Richard Nixon. So when he talks about politics, it is fair to say that Stein has an informed view -- whether you choose to agree with his analysis is another issue. From Stein's perspective, McCain has been running an uninspiring campaign -- one that lacks a coherent message. "Mr. McCain is running the absolute most pathetic campaign I have ever seen in my whole life," Stein said in his unmistakable monotone delivery. "His campaign is just heartbreakingly pathetic. He is a very impressive guy. He is a brave guy, but he is running the most lackluster campaign I have ever seen in my entire life. I would have thought Bob Dole's campaign would have set a record for poor campaigns, but this one is even worse. I mean it is shocking." Thus Stein's answer to turn it around is Rove -- architect of Bush's back-to-back presidential victories -- who he describes as "about the smartest in the country in terms of politics." A McCain campaign spokesman politely sidestepped Stein's criticism by saying the campaign is well-equipped to defeat Obama in November. "Our campaign is competing for every vote," said McCain spokesman Tucker Bounds. "We will have the resources and organization that John McCain needs to win this race because there is excitement for an independent leader who will fight wasteful government spending, grow the economy and keep taxes low. Presumably, that is why Ben Stein is a supporter of ours -- which is an endorsement we are very proud to have." While Stein identifies himself as a Republican, he certainly does not always march in lockstep with GOP leadership. For example, Stein is backing Al Franken's bid for the Senate. That's right, that Al Franken, the liberal Democratic comedian who is seeking to oust incumbent Republican Sen. Norm Coleman in Minnesota. "He is my pal, and he is a really, really capable smart guy," Stein said of Franken. "I don't agree with all of his positions, but he is a very impressive guy, and I think he should be in the Senate." • Karl Rove: "He is one of the nicest, straightest-shooting, most heads-up, kindest guys I have ever met. He is a close friend, and I love him. And the idea that they (media) treat him as some kind of a sinister figure is just ridiculous. He is basically just a big nerd who has an incredible amount of data stuck in his head about what each congressional district is like in terms of its voters." • Liberal Hollywood cocktail parties: "I used to go there, and people would make cruel fun of me and bait me and want to start arguing with me, and who needs that crap?" "In fact, there are actually Republican groups now that have parties in Hollywood, and I don't go to their parties, either, because, frankly, I work so incredibly hard, and I am on the road so much that when I am home I want to be in bed with my dogs and not -- and my wife too -- and not out talking to some people at a party." • Whether Ferris Bueller deserves another day off -- a sequel? (Stein played the economics teacher): "I would love for there to be a sequel, and I would like it to be a sequel about a 63-year-old man who takes a day off and has an incredibly good time and gets away with it. That's what I would like." • What film historians will say about "Ferris Bueller's Day Off:" "I think that is the most life-affirming movie possibly of the entire post-war period."